With the romantic month of February in full swing, we decided to check out Bastille Brasserie & Bar. 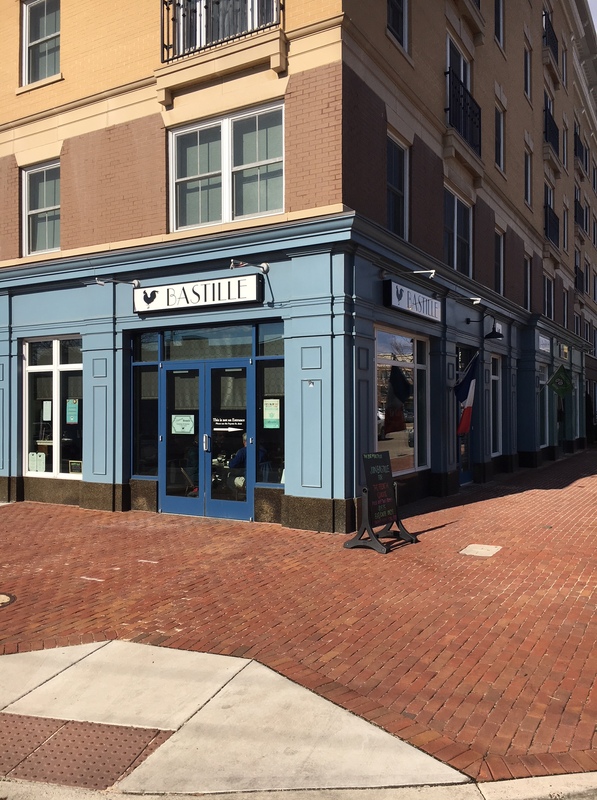 The restaurant was formerly located at the north end of Old Town on Royal Street but when the new Asher Condos opened on Fayette Street, Chefs Christophe and Michelle Poteaux relocated to the new location at 606 North Fayette Street. And true to a quote on their website – “Since 2006 their award winning brasserie and wine bar has continued to offer guests a contemporary spin on French cuisine set within a sophisticated yet comfortable atmosphere”- they definitely have set the bar high. Upon entering the restaurant you will encounter a bar area to the left with a beautiful bar straight ahead. The dining area is off to the right which helps separate any noise that might come from the bar area. Something that impressed me was the view into the kitchen from both the bar area and the dining room. It amazes me how these kitchens run like clockwork. The space is very contemporary and straight forward. Looking forward to the spring and summer, the restaurant also has a beautiful patio that provides for outdoor dining in the nice weather. Like many establishments these days, the Poteaux’s use seasonal, locally sourced and farm fresh ingredients. They also present an expansive wine list that is very reasonably priced, some unique draught and bottled beer selections and creative cocktails. As we discovered, Bastille has something for everyone. The night we arrived happened to be the first night of Restaurant Week in Alexandria and the place was pretty busy for a Tuesday night. Everything that they offer on the Restaurant Week menu is also available on their regular menu. I also noticed that there were no salt or pepper shakers on the tables and with a little research I discovered that a proper chef will season (salt and pepper) his or her creations perfectly. I had to agree that no additional seasoning was necessary. I started out with one of my favorites since I first ordered it in Montreal in 1972…French Onion Soup. Maybe my first encounter with this dish has jaundiced me. I thought the soup here was delicious but a little weak in comparison to others that I prefer, however, the proportion of cheese and presentation was perfect. My dining companion started off with the Betteraves, oranges, and chevre. 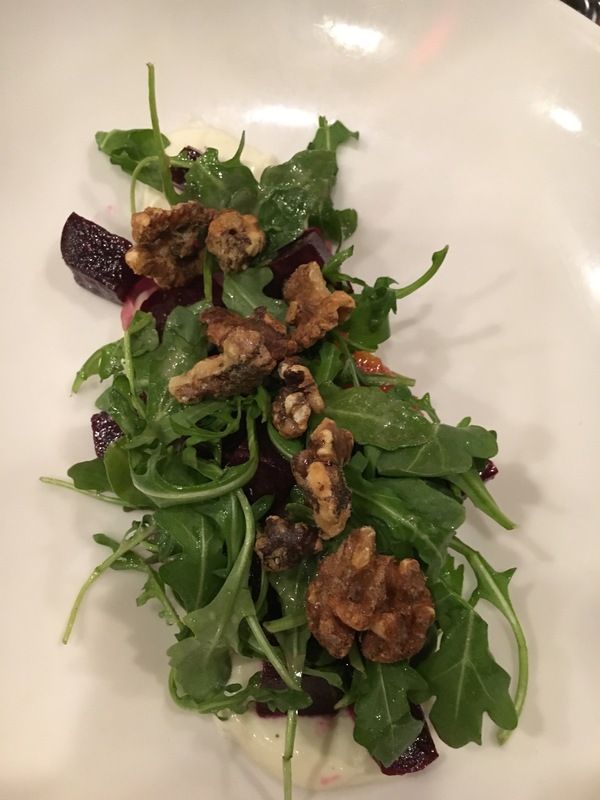 This translates in to organic beets, oranges, baby arugula, pickled shallots, fresh goat cheese and walnuts. She assured me this is one of the absolute best beet dishes she has had and she prides herself on being a connoisseur of said dishes. 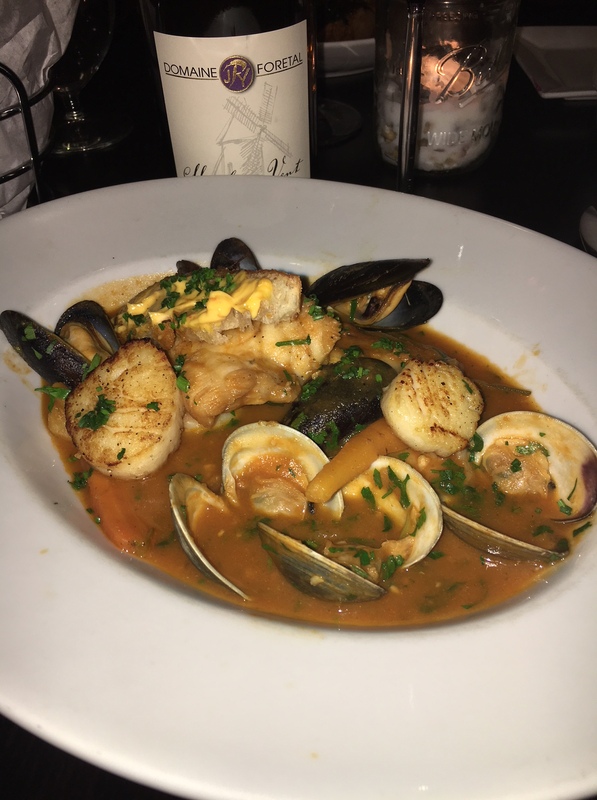 For the entrée I ordered Bouillabaisse, a traditional Provencal fish stew originating from the port city of Marseille. In this case my previous experience was non- existent, as I can’t ever remember trying the dish. Placed around a plump piece of white fish were small clams, succulent scallops, firm shrimp and mussels. All of these items were cooked to perfection and the small baby carrots and other seasoning gave the sauce a wonderful fresh taste. It was nice and thick…perfect for dipping the accompanying bread. I will definitely try this dish again as, for me, Bastille has now set the standard. The other entrée we ordered was the Mignon de porc aux Epices. Otherwise known as pork tenderloin rubbed with paprika spices and served over sweet potatoes and onions “a la Lyonnaise and Brussel sprouts. All she said was, “WOW”. Again, a big fan of the other white meat, she said it was cooked to perfection and the flavor combinations were spot on. I am going to order this the next time! For dessert I once again went for something new and ordered the Gateau chocolat…a Valrhona chocolate truffle cake, pecan praline sauce and banana ice cream. This was excellent! The flavors blended very well even though the intense chocolate flavor from the truffle tried to dominate. Keeping with her affinity for fruit, the Cheesecake au citron was L’s choice. This is a different take on what you perceive as a piece of “cheesecake” with fruit. It is sort of deconstructed – the cheese part was in the center of the plate covered with lemon cream and topped with graham cracker crumbles. 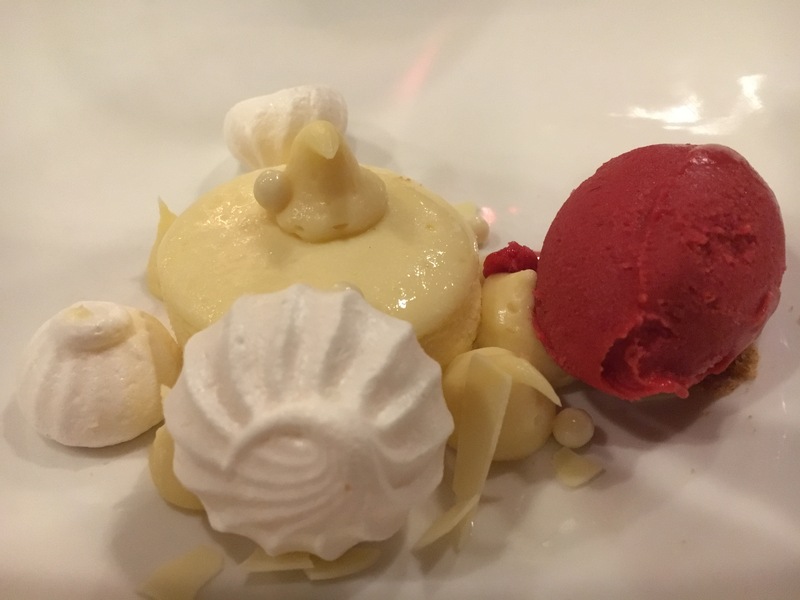 At its side was a small scoop of raspberry sorbet and the final touch were the little puffs of meringue placed around the plate. Her recommendation is that everyone should try it – guess that says it all. There is something going on all week at Bastille. Starting off the week, Sunday Sippers takes place from 4-9 pm featuring select bottles of wine for $20. They have Happy Hour Tuesdays through Fridays from 4-7 pm with both drink and food discounts. 1/3 Off Thursday is a good night to be here if you really like wine with dinner – 33% off of all wines from 4-9 pm. Both Saturday and Sunday feature their Mimosa Brunch from 11:30 am to 3 pm. The only reason there isn’t anything happening on Monday is because they decided to take that day off and are closed. If you have never been to Bastille or haven’t been in a while, do yourself a favor and put it on the top of the “to do” list.